A pleasant riverside town, whose origins can be traced back to AD 676, when a Benedictine abbey was founded here, alongside the Thames. During the medieval period the town became a prosperous river port, growing rich on wool and agriculture. However the town's fortunes fell when the abbey was dissolved under Henry VIII. Not all the abbey buildings were destroyed and many still remain, including the 13th-c Checker, Long Gallery and the Checker Hall (later used as a theatre). 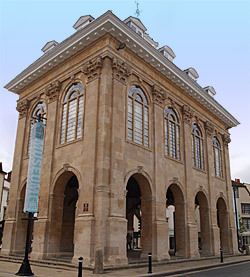 The abbey's gatehouse also still stands, facing the Market Square. On one side of which is St Nicholas church, dating back to Norman times, and on the other side is the town's Guildhall. 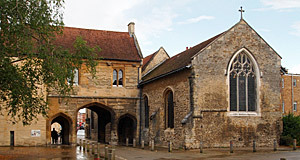 Originally an outbuilding of the abbey, the Guildhall was brought by the local corporation in the 15th-c to be used as a courtroom, and is now used for civil functions. The square itself is dominated by the town's elegantly pillared 17th-c Baroque County Hall, which has been described as the 'grandest market house in Britain'. The upper floor is home to a Museum of local history and archaeology. The town centre also boasts many fine Georgian buildings, and some earlier timber-framed houses, the finest of which can be found in East St Helen Street. St Helen's church, at the end of East St Helen Street, dates mostly from the 14th and 16th-c. It has five aisles, which uniquely makes it wider than it is long. The churchyard is bounded by fine 15th-c and 18th-c almshouses. Other historic buildings of interest include the town's early 19th-c gaol (off Bridge Street), which was constructed by Napoleonic prisoners of War. 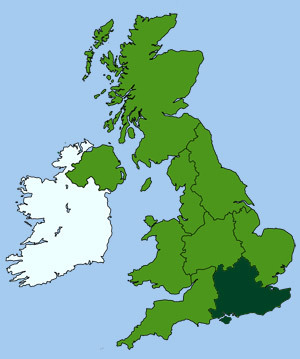 Although a fairly small and insignificant place today, Abingdon was originally the county town of Berkshire, up until 1870, when the title was transferred to Reading. Abingdon became the home of MG cars in 1949. For details of the MG works history visit The Abingdon Works Centre website. 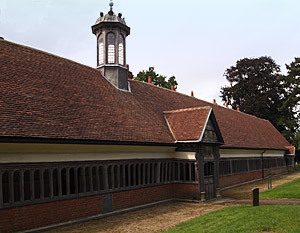 The museum displays a number of important relics from the Abbey, plus items of social history and local domestic life. There is also a small collection of fossils and archaeological remains as well as numerous ancient documents and charters on display. Two Crossley steam pumps, on display in the museum basement, were once used to pump the town's water supply.